Wales and Northern Ireland continue their preparations for the Euro 2016 tournament going fce to face in a very interesting international friendly on Thursday night. This article contains our WALES v NORTHERN IRELAND betting preview with the best predictions, betting tips, odds, probable lineups, streaming links, bookie bonuses and no deposit free bets on the match! Welsh boss Chris Coleman is without his two star men in Gareth Bale and Aaron Ramsey while Ben Davies, and James Collins are all among the other absentees. Southampton reserve Lloyd Isgrove and Championship players Jazz Richards and David Cotterill are among the call-ups. Hal Robson-Kanu, Andy King, Paul Dummett and Dave Edwards are also unavailable while Andy King may miss due to illness. Northern Ireland topped a tricky qualification group that included Romania, Greece and Hungary to qualify for their first major tournament since 1982. They also proved hard to beat in qualifying, losing only in Romania and conceding only eight times. The Irish have beaten Latvia 1-0 in their first warm-up match and stretched their unbeaten run to 7 matches, 4 wins and 3 draws. Northern Ireland will also be without a key man as a knee injury ruled Chris Brunt out of the finals. Daniel Lafferty, on loan at Oldham Athletic from Burnley, is among those aiming to press his case in Brunt's absence. The likes of Jonny Evans, Gareth McAuley and Craig Cathcart will start in defense. Furthermore, manager Michael O'Neill may hand international debuts to Peterborough United defender Michael Smith and QPR striker Conor Washington. Northern Ireland were beaten 2-0 by Wales the last time the sides met in May 2011. This also means that Wales are unbeaten in the last 6 direct encounters. The Welsh team kept seven clean sheets (from 10 matches) in Euro 2016 qualification and their last six home matches have seen under 2.5 goals. Wales (3-5-2): Hennessey – Gunter, Williams, Davies – Richards, MacDonald, Allen, Ledley, Taylor – Vokes, Isgrove. Northern Ireland (3-5-2): McGovern – McNair, McAuley, Evans – McLaughlan, Davis, Baird, Norwood, Dallas – Ward, Lafferty. Price boost! 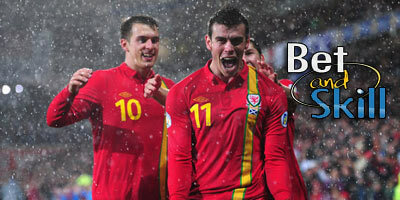 Get 7/1 Wales to beat Northern Ireland + £100 bonus! No Risk! Crazy price! 7/1 Wales to win the match! £10 max bet. Enhanced 4-fold: 30/1 Wales, Spain, Czech Republic & Denmark all to win! Enhanced treble: 25/1 Wales, Spain & Ukraine to win! "Wales v North Ireland predictions, betting tips, odds and lineups (International Friendly - 24.3.2016)"